Andrew Cobb was born in the United States in 1876. At the age of 14, he moved to Greenwich, Nova Scotia, with his mother and sister. After graduating from Acadia University he earned a master’s degree in architecture from the Massachusetts Institute of Technology before moving to Paris to study at the Ecole nationale des Beaux-Arts from 1907–1909. He began practising in Halifax in partnership with Sydney P. Dumaresq, whom he had met at Acadia, collaborating on the memorial tower, known as the Dingle, erected in Sir Sandford Fleming Park in 1912. Cobb went on to become known for his domestic architecture in Halifax and Bedford, as well as for institutional designs such as Dalhousie University's Science Building, Macdonald Memorial Library and the University of King’s College, constructed on the Studley campus of Dalhousie from 1928–1931. He died in 1943 in a motor accident. 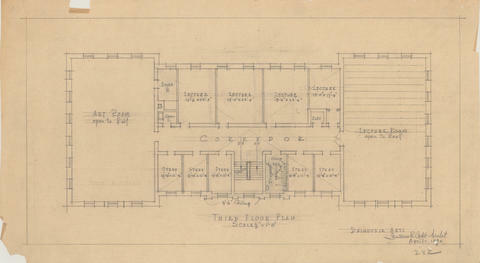 Item is a technical drawing of the third floor plan of an arts building for Dalhousie University. The drawing is probably a suggested plan that was never used. Item is encased in plastic.